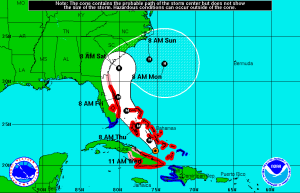 ATTENTION: Due to the upcoming Hurricane Matthew our offices will be closed Thursday Oct 6th, 2016; and will re-open on Friday October 7th, 2016. For any inquiries do not hesitate to contact us today at 305.663.6519. Remember to prepare for the potential land fall of Hurricane Matthew. Below you can find two links that will provide you with a list of stores and gas stations that can operate by generators in the even of power outages. http://www.miamidade.gov/fire/library/hurricane/stores-with-generators.pdf http://www.miamidade.gov/fire/library/hurricane/gas-stations-with-generators.pdf Be safe, all the best, Keyes Insurance.